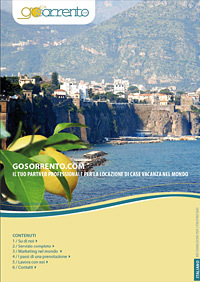 In our opinion, Sorrento is a holiday destination all year round. With our experience in the international market, we seek to promote this region in Italy, Spain, Germany, Austria, Ireland, England, USA, Russia and France. Our reservation software has been enhanced continously since 2004 and has been optimized for the rental of holiday homes. The Italian Real Estate Ltd. gives you the oportunity to offer your holiday homes all over Europe in the languages ​​German, English, Spanish, Italian, French and Russian. Our multilingual customer service is another great possibility for owners to rent their accommodation even better. Thanks to our extensive experience in Online Marketing, your offer on GoSorrento.com will always be on top positions in search engines (Google, Yahoo, MSN, etc..). With these excellent searcch engine listings we are able to reach a huge target group and therefore we have thousands of reservation requests a year. If you are interested in receiving more information about our systems please do not hesitate to contact us.